How Dry Does the Deck Need to be After Cleaning it to Apply the Stain? Update for 2019: How Dry Does the Deck Need to be After Cleaning it to Apply the Stain? Since we published this article, the Restore-A-Deck Wood Stain was introduced, allowing for this stain to be applied to a damp deck. 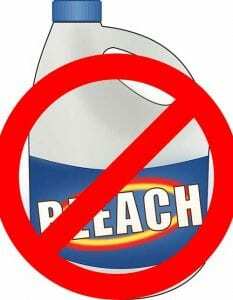 For all other brands of stain, we still recommend you wait until the surface has completely dried before applying. We always appreciate your input, so feel free to leave a comment below with pictures of your deck stain projects. 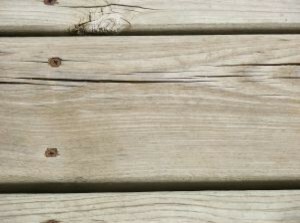 The first step in deck restoration and/or maintenance is to clean and prep the wood. This is the key to a long-lasting finish. Properly prepped wood will allow the deck stain to penetrate and perform to its full potential. So how dry does the deck need to be after cleaning it to apply the stain? Well, that can be measured in several ways. Here at DeckStainHelp.com, we strive to remain the Internet’s number one reference for your deck stain questions, opinions, and reviews. In this updated article, we suggest how to blend new and old deck boards for a beautiful even surface. We would like to hear what you think, so feel free to leave a comment below. There are many reasons why you would have a mix of new and old deck boards but it can be a common situation. The most frequent reason is that some of the boards needed to be replaced due to decay or wood rot while other boards were still in good condition. It is also very common for a deck owner to protect the deck with a stain once all the repairs have been made. The dilemma is that new boards and old boards look very different when they are stained. To understand why this happens may help you to minimize the problem. Once old deck boards weather, the top layer of wood fibers begin to gray and become soft. Newer deck boards are denser and are very hard. The older boards will absorb more deck stain and appear much darker than the new denser deck boards which appear lighter. We appreciate you visiting Deckstainhelp.com as we continue to be your go-to source for the latest in deck restoration news and trending topics through 2019. If you are looking for honest deck stain ratings, look no further. 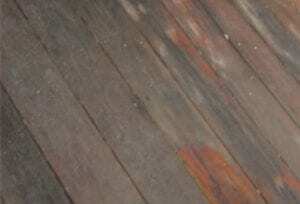 Below, we mention some tips for restoring an old neglected wood deck. Feel free to leave a comment below with any pictures you may have. Wood decks can be a beautiful addition to any property but when neglected they can also become an eyesore. When a deck goes too long without being maintained sun and water damage occur. The wood loses its natural oils and becomes very dry and porous. Cracking, splitting, warping, and graying are all signs of an old deck that has not been protected against weathering. Do a thorough look over for any rotten boards and replace them. Check for loose boards and railings and tighten these up as well with decking screws. Check foundation for any structural damage. It is not impossible to bring old wood back to life. A little care and maintenance can revive most neglected decks. 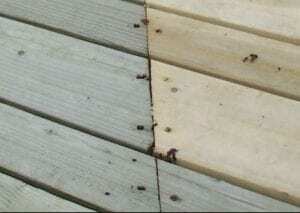 If the deck is still in a good structural condition the grayed wood can be cleaned using a wood deck cleaner.